Pisum fulvum Sibth. et Smith. (accession WL2140) was crossed, in both directions, with seven accessions representing other pea taxa: P. abyssinicum A. Br. (1 accession), P. sativum L. subsp. elatius (Bieb.) Schmalh. s.l. (5 accessions) and the cultivated pea, P. sativum L. subsp. sativum (1 accession). 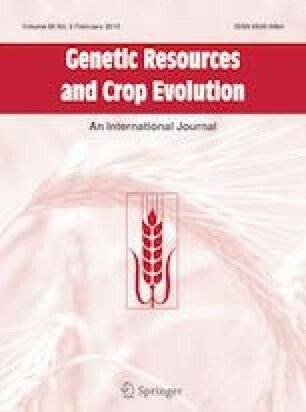 Efficiency of crosses (the average number of hybrid seeds per cross), pollen and seed fertility and general quantitative traits of reciprocal F1 hybrids were evaluated in a greenhouse experiment. Crossability with P. fulvum as the seed parent was very poor but at least some viable seeds were obtained in all crosses. F1 hybrids with accessions VIR320, 721 and CE1 (P. s. elatius) were very weak and produced 0–3 seeds; those with WL1238 (P. s. sativum) were variable in vigour and fertility; both reciprocal hybrids with JI1794 were small plants. Other hybrids were tall, vigorously branching but poorly fertile plants. In all F1 hybrids, pollen fertility did not exceed or scarcely exceeded 50% without differences between reciprocal hybrids except for the pair P. fulvum × P. s. sativum. Pollen of all hybrids contained micro-grains formed around chromosomes retarded in anaphase I. Seed fertility was low, with significant differences between reciprocal hybrids found only in the pair P. fulvum—JI1794. F1 hybrids between P. fulvum and peas of the evolutionary ‘lineage AC’ showed higher pollen and seed fertility than those with peas of the ‘lineage B’. The sum of evidence available suggests that P. fulvum does not differ from P. sativum by reciprocal translocations. Pea crop wild relatives Crossing barriers Crossability Reproductive compatibility Pisum L. Pisum fulvum Sibth. et Smith, Pisum sativum subsp. elatius (Bieb.) Schmalh. The work was supported by the Russian State Scientific Project No 0324-2018-0018. Lyudmila P. Romkina made a large work with plant handling, Arseniy K. Yadrikhinskiy helped assessing pollen and seed fertility, Vladimir Solovyev helped with quantitative data analysis. Plants were grown in the greenhouse of the Artificial Plant Growing Facility, ICG SB RAS; cytological analysis was carried out in Microscopic Centre Facility ICG SB RAS.